Welcome Back! 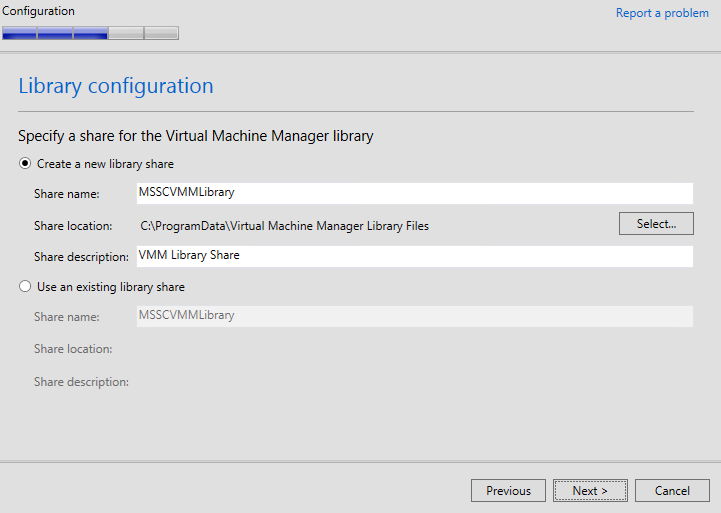 For this article I am going to try and cover SCVMM (System Center Virtual Machine Manager) well enough to allow you to install it for testing purposes. This isn’t intended to cover all of the details as I think there is too much material here for one post and I haven’t had time with my new job to properly explore deeply yet. If I have missed something important or you would like me to go into more detail on a part of this, please send me a message and I will be happy to look into it. 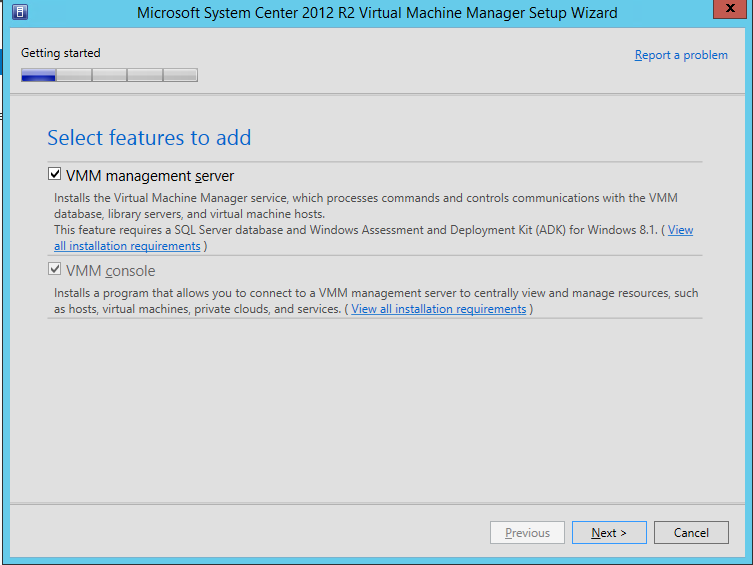 SCVMM is the functional Hyper-V equivalent to vCenter in a vSphere environment. 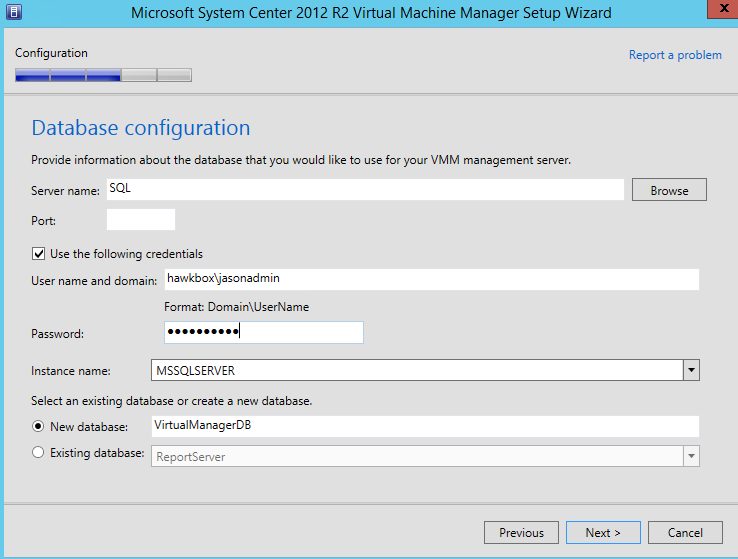 I have rather extensive experience dealing with vCenter, so I wanted to try and familiarize myself with SCVMM in the same way. 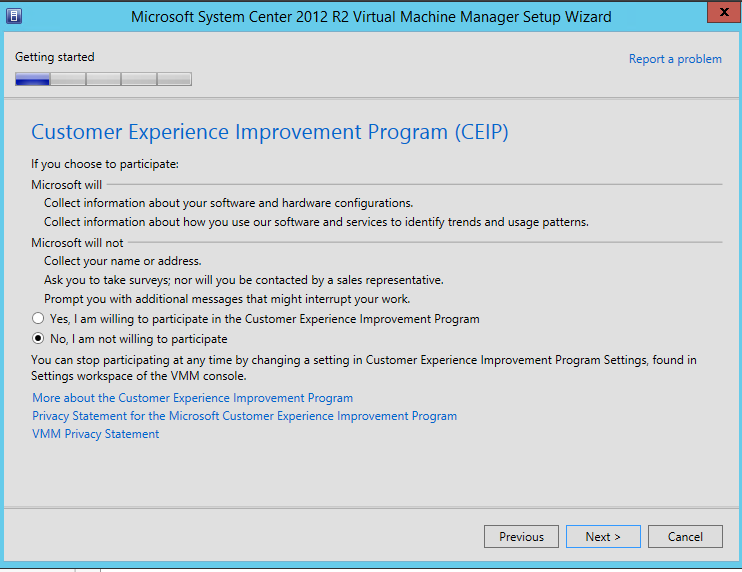 With System Center 2012 and 2012 R2 it comes as part of the entire package, which is rather handy. I am going to go through step by step and show my experience with it. I will make note of any caveats or landmines I come across during the setup. Probably the number one thing to consider before getting started is your SQL environment, where are you going to host your SQL DB? 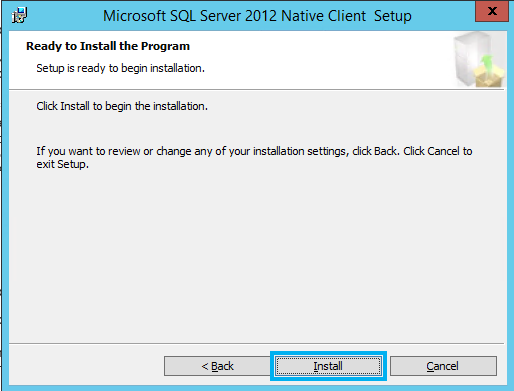 I am in the process of familiarizing myself with SQL 2012 right now so I have chosen to deploy this on another server. 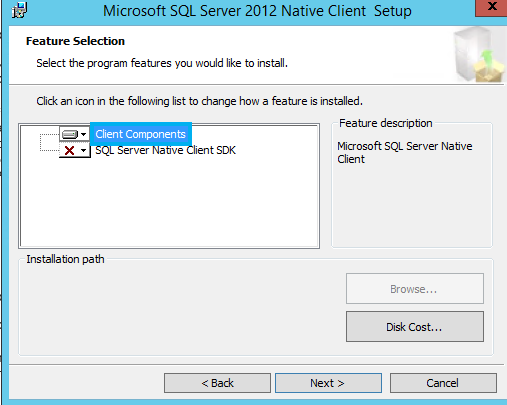 You are also able to use a local SQL Express install should you only want to run this in testing. I would recommend a dedicated server if you plan to run this in production. 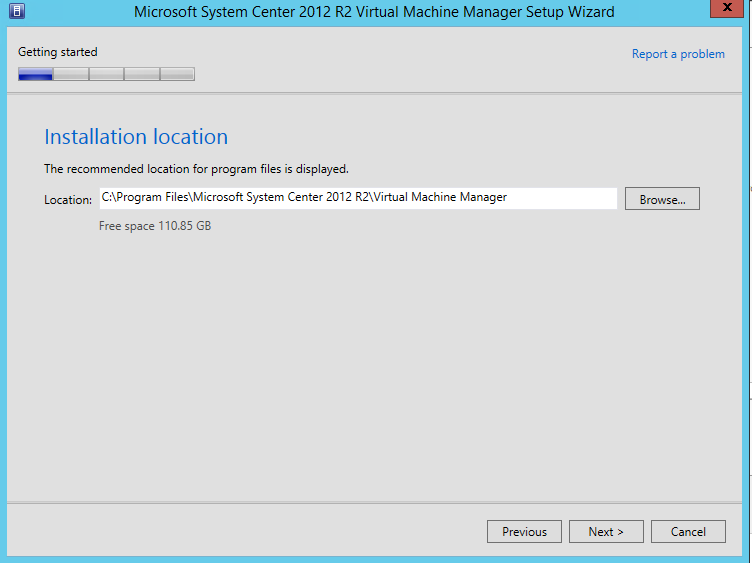 For the purposes of this article I deployed a new 2012R2 server from my Hyper-V environment using the MDT (Microsoft Deployment Toolkit) which I will further explain and cover in another article. 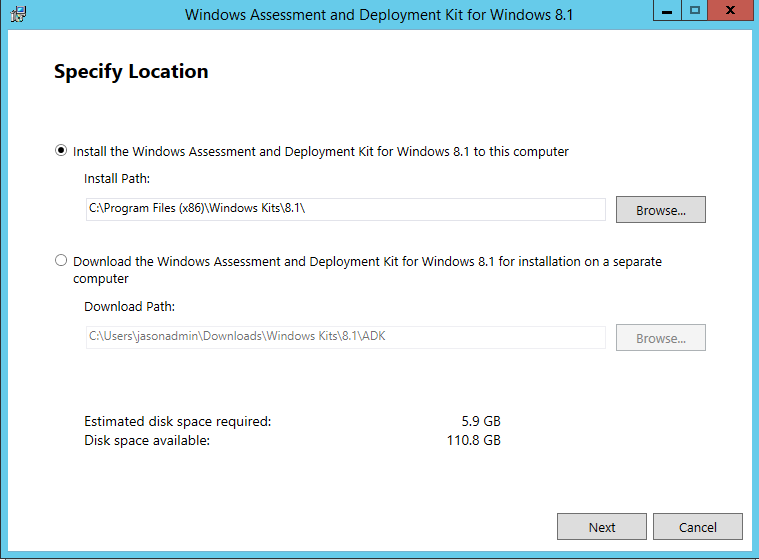 I want to cover this separately as it’s an extremely useful tool whether you are using Hyper-V or vSphere. 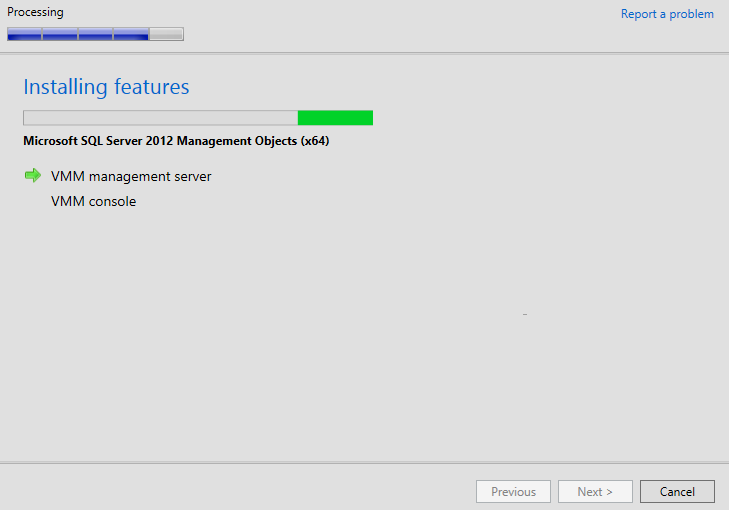 Using this fresh install I started in much the same way a windows vCenter install would begin. 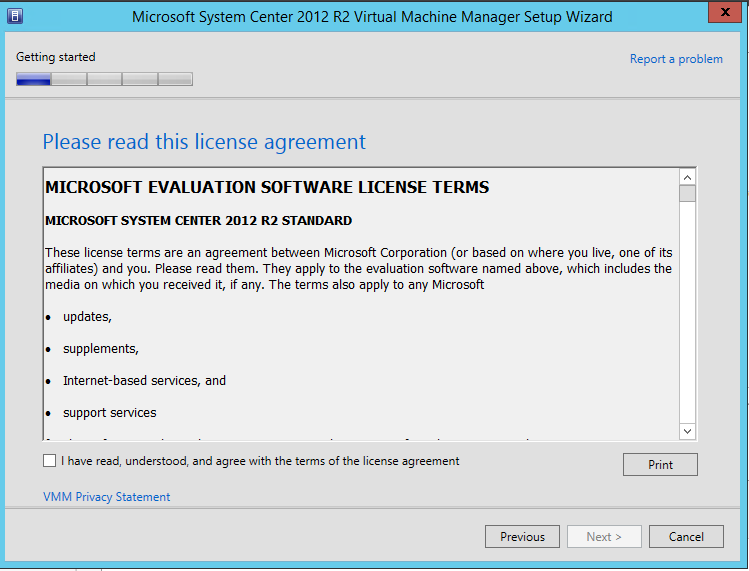 I downloaded the evaluation ISO and mounted it in the VM I created, from there I ran setup.exe to begin the process. 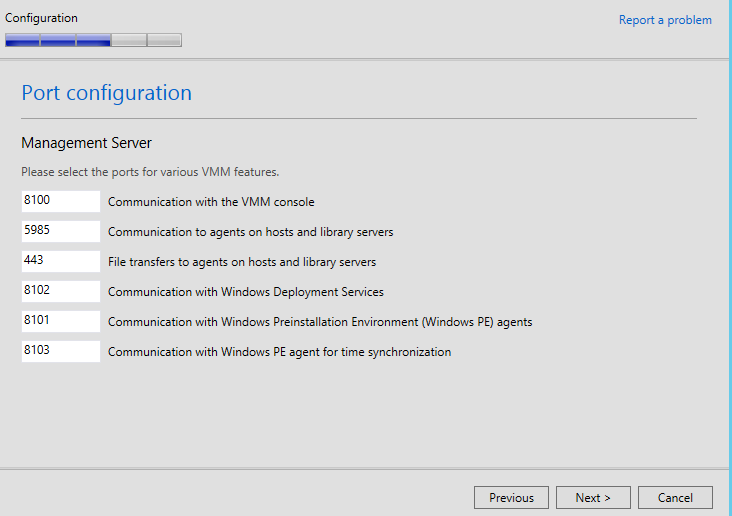 Choose the Install option, installing the server automatically adds the console. Next option is product key, for now evaluation is fine. If you have one, feel free to enter it. I am doing this as a lab so there is no need for one right now. Agree to terms, if you don’t you go no further. Yes or no to CEIP, I really don’t have much of an opinion on this. Unless you’re doing something confidential it’s probably fine to agree to it. Decide where you want to install to, I’m using defaults for this. If you have a different system feel free to make use of it. Hmm looks like I’m missing something. Need to install the Windows 8.1 ADK for this. Grab the ADK. This utility is used to enable automated deployments and it is quite critical. Download and install it. Decide where you want to install it. I chose to install this computer. CEIP again, do as you wish. You will have a EULA come up, you know the deal. Decide what you need from the ADK. 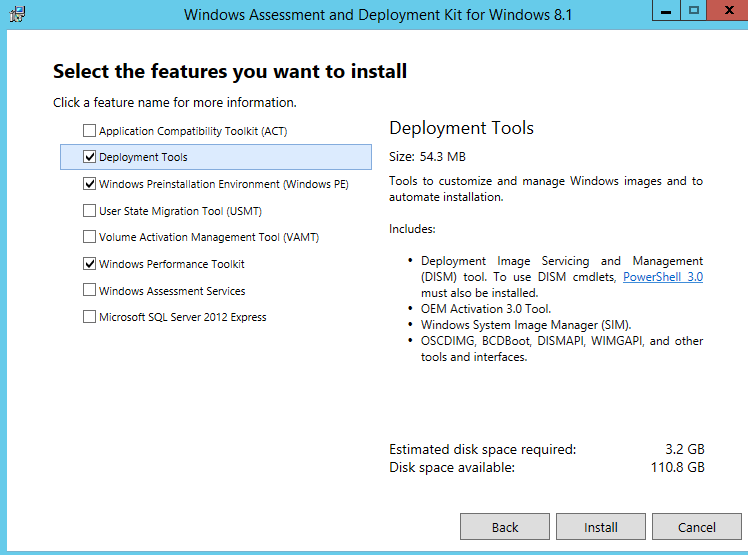 Most likely, WinPE and Deployment Tools is all you really need. 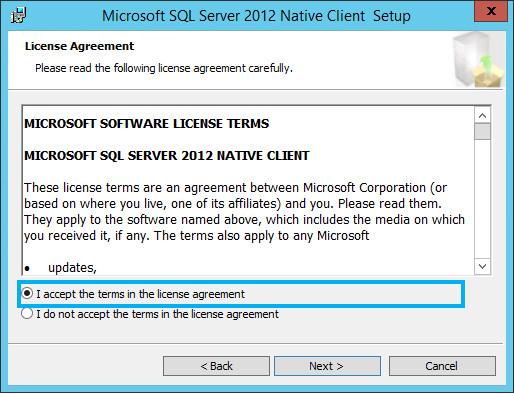 If you do not have a separate SQL server, check Microsoft SQL Server 2012 Express. Let the install run, this can take a while. Once you’re done you can go through the getting started guide or not. It isn’t relevant for my purposes so I am not bothering. 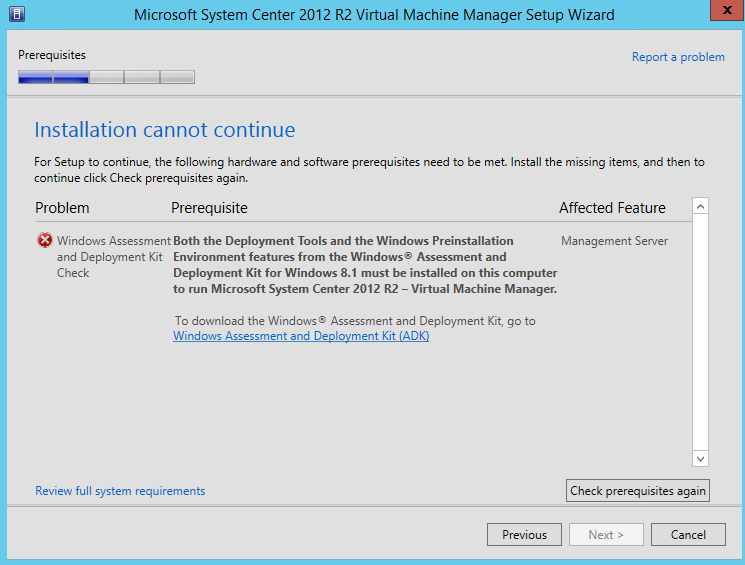 Go back to your SCVMM install and check the prereqs again. For me I got a new warning. 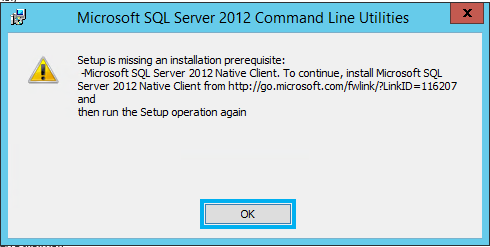 I’m downloading the SQL 2012 command line in annoyance. 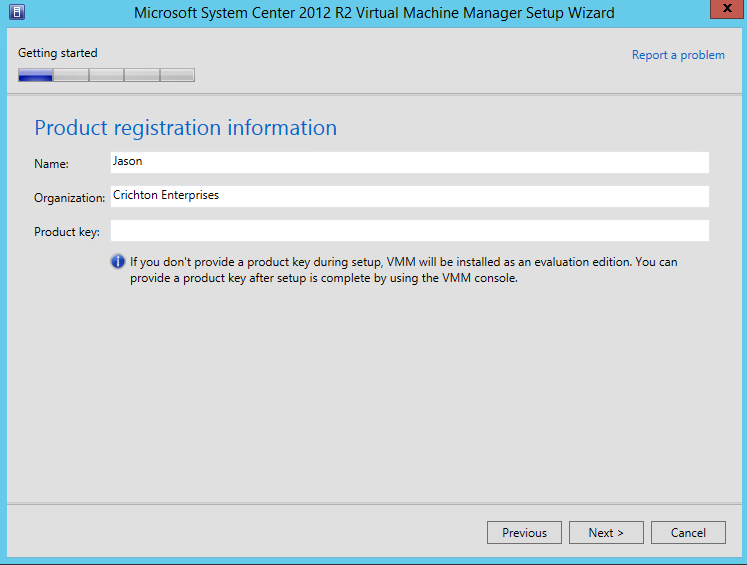 I wish MS installers were like Veeam or Dells OME and allow you to just install the necessary files from the checker. It would make everyone’s life a lot simpler. If you download through the download link you get the following information in a text file for whatever reason. So click on install instructions and find the command line feature pack in the list. This is the one you want. If you have the luck I have you will get the following popup, because why tell me this first? So now we need to install the native client. It’s also in that list of files to download. Conveniently it is directly above the command line utilities (As of May 2014 at least). Download and install it as well. You really don’t need the SDK for this. 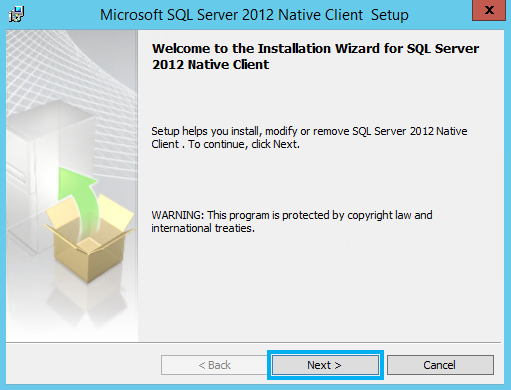 Simply click install and it will proceed to install the native client. Once you’ve finished this install now install the command line utilities using the same steps as the native client install. Now we check our Prereqs again. Mine shows a pending restart but yours may not. So I’m restarting. No big deal, simply wait for it to come back up and run the installer one more time. Post restart we return to the prereq check and see how we’re doing. Basically for this stage just clear up anything outstanding before you proceed. In my case, the second time through no prereqs failed and it moves on to the DB configuration. If you installed the SQL Express version just point to localhost, otherwise point to your SQL DB’s hostname. In production use some properly configured credentials, for this I am using my regular lab Domain Admin account. Next you need to configure the service account. NOTE!!!!! This cannot be changed afterward, if you change the account in services you will break this and need to reinstall. I have learned this the hard way. For this lab I am just using the local account. Additionally if you are running HA you need to store your encryption keys in AD, it’s fairly easy to do if you have an existing AD, click the blue link and follow the instructions. Port information is auto populated and probably best to leave alone unless you have a specific reason to modify it. Next you create your library share. Put this in a location that will not cause you problems down the road. In production, that would not be the C drive. Finally assuming everything has gone nicely you will get a page with a summary and an install button. At this point you’re committed so you better press that install button. Otherwise why are you reading this? NOTE: Make sure the account you set to create the database has to appropriate permissions or it will fail and you’ll need to start all over. Installing takes a while, this is normal and not a problem. At this point I ran into some SQL problems with my first attempt, but I believe they were related to my poorly set up lab DNS structure. I plan to do a full install from scratch again to verify this when I have the time. 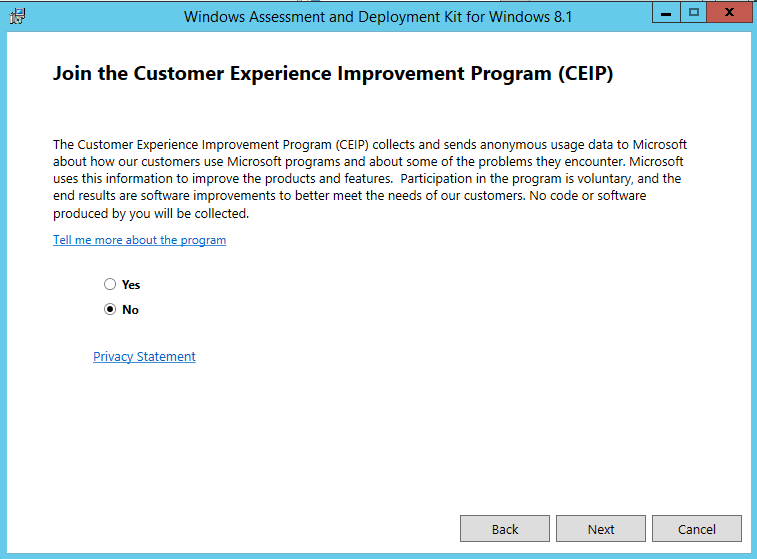 When you launch the client, if you get a popup about a folder access being denied go into explorer and follow the path till you get to the last folder, it should ask you to provide permission and afterwards that error shouldn’t come up any more. 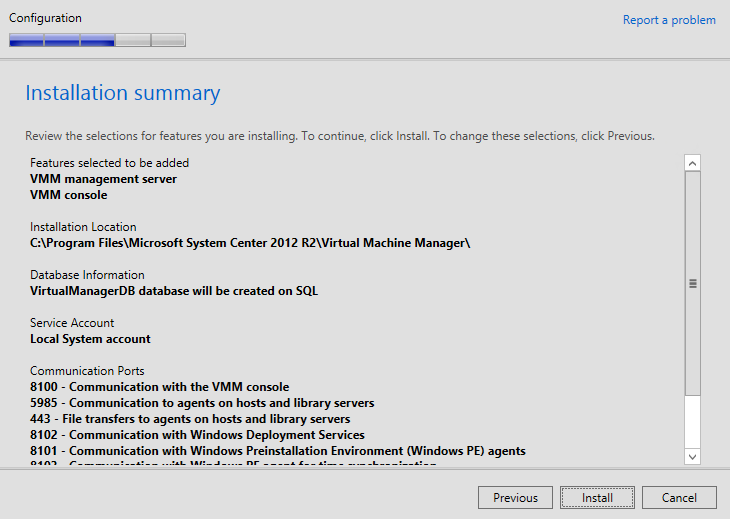 SCVMM is now installed. 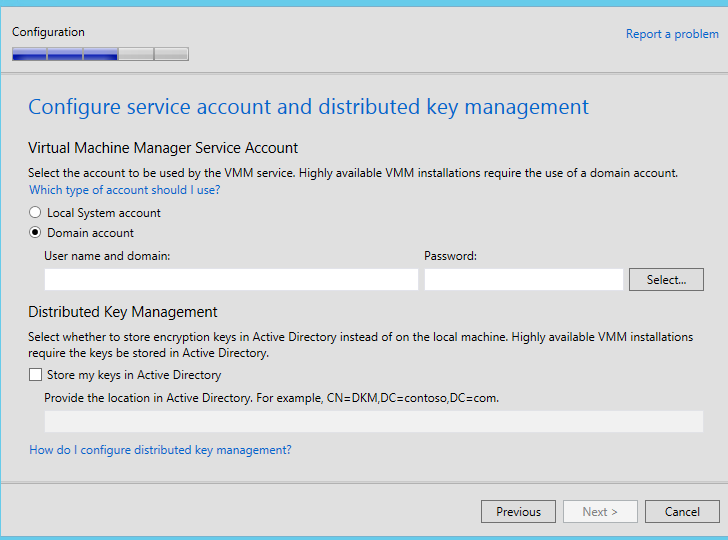 Configuration of SCVMM is for another day, and another article. Hope you all have a great week!